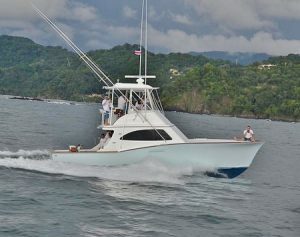 This 43-foot Cold-Molded Flybridge Sportfishing Yacht powered by twin 455 c-7 Cats with a 9KW Northern Lights generator set fishes out of Los Sueños Marina in Playa Herradura. Captain Franklin Arrieta is at the helm. It has 25kw X Brand radar; 5,000ft echo sounder; GPS navigator on Navnet screens; Simrad autopilot, two VHF radios and JBL stereo; Penn reels, heavy and light tackle, stand-up and fly rods, tuna tubes, a 169 sq ft cockpit, fighting chair, and fully air conditioned salon and head. Will also fish Quepos.